Sorry the second half wasn’t up ready for lunchtime today! Wedding fever appears to have taken over at my Mum’s house and since I wrote the last blog I have enjoyed a spa day out with my Maid of Honour and a bridesmaid, sat and watched my bridesmaids all try on their dresses with shoes and underwear to ensure all would look beautiful on the day. I’ve completed the rest of the wedding signs I began a few weeks back, I’ve had my eyelashes tinted, bought some cards for thank yous and some gift wrap for gifts, helped organise my future Mother in Law with the wedding cake (well, taste the offcuts! ), cut and scored all of the order of service booklets and a whole lot more. 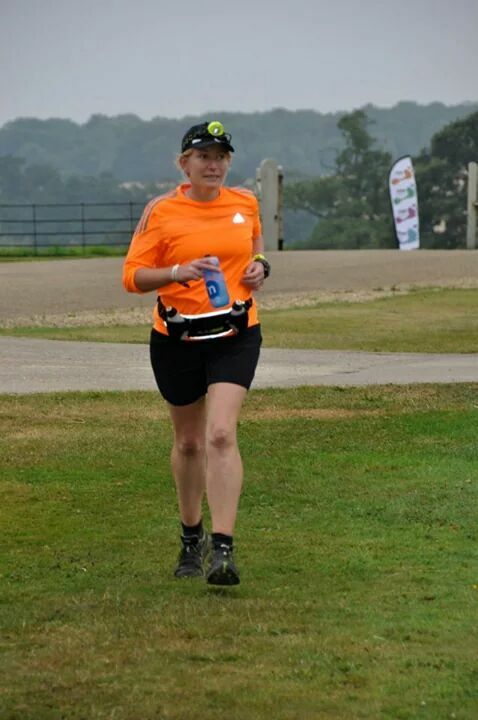 But that’s for another post…the abuse I’ve been getting on Twitter this morning indicates that it’s time for a break from the wedding madness and time to complete my Grim Reaper race report! When I got back from my fourth lap, Dan was at the campsite waiting for me with three cartons of chocolate milk and an extra eight oranges. (My hero!) It was great to see him in the middle of the race and also good that he could reassure himself that I was actually doing alright and that he had nothing to worry about. I stopped for slightly longer as Dan had traveled over to see me and whilst I was seeing him I used this time to get changed out of my club vest and into my long sleeved Conti top instead. During the upcoming lap it was due to start getting dark so I knew I would need to take my headtorch out with me when I set off this time as well. 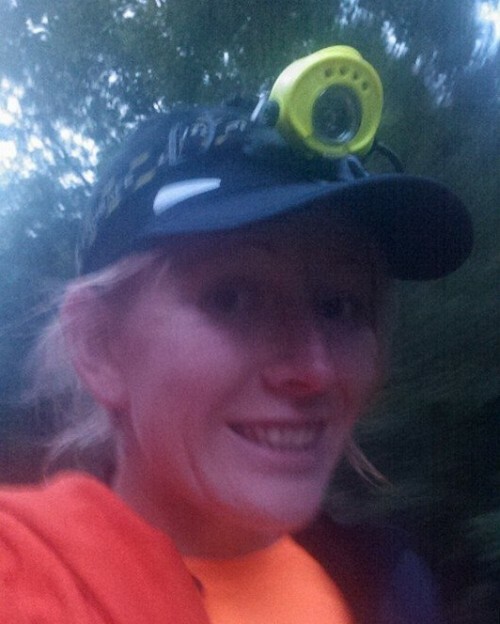 Blurry dark mid-run headtorch selfie! I was glad I did as by the time I entered the wood the light was very limited and I would have had to squint to see where I was going. My headtorch faded quickly and it did slow me down a lot as I couldn’t really trust my eyesight as to where the roots were on the track through the wood. For my final two laps Kev replaced the batteries in his headtorch for me to use so I had less problems. I think seeing Dan at mile 40 and being able to overtake several runners as it got dark who were less used to running at night picked me up a lot mentally on this lap (although I can’t really say that I ever really struggled). Knowing once I buzzed my chip timer over the scanner at halfway was an amazing feeling as well. The furthest I had ever run before Friday was 44 miles, so to know that I had beaten that, and that unless something drastic happened knowing that I would finally make the 50 mile marker put a massive grin on my face. I arrived back at camp beaming and striding out along the stretch past the campsite ready to refuel and go again. Tracey and Kev had been out for a walk and I surprised them as they hadn’t expected to see me coming through so soon! Just before I set off for lap number 6 Dan texted to let me know he was so proud of me for finally hitting the 50 mile mark (Grim was my third time trying!) and that I was currently sitting in eighteenth place. This spurred me on further and despite thinking my time for running during the race had almost passed, I ran the majority of the first half of lap six with a quick walking stride when I felt was necessary. I never felt ‘alone’ during the race, but in the night time there were much longer stretches that went by without seeing other runners. 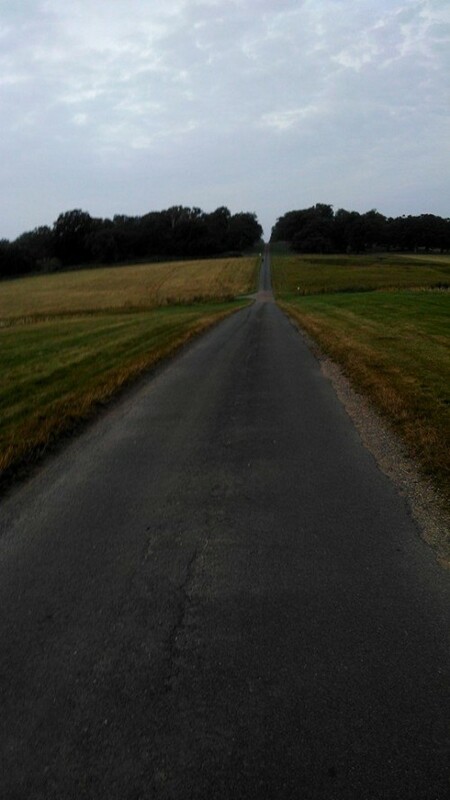 By this point, nearly all runners that had entered the 40 miles had completed the event so the field had thinned a lot. Towards the end of the sixth lap my legs had begun to feel a bit achy. Up until this point, they had felt great! The regular feeding and constantly replacing of my electrolytes must have helped and I could not believe how strong and chirpy I felt this far into the race. I stayed at the campsite much too long after the sixth lap. By luck, Tracey had just woken up as I arrived back. Everyone else had fallen asleep. Gillian was waiting for Colin to come through and he actually came through whilst I was still there. Because Colin is so incredible, he had just finished 80 miles by this point! It was good seeing him for myself as, other than for 10 minutes on lap four as he lapped me, I had only gotten updates of his progress through the others. He was heading for a good placed finish and didn’t spend long before shooting off for this final two laps. Sitting for so long to refuel (apparently I took nearly 40 minutes including a toilet trip and change of clothes!) meant that I got cold so when I set out on my final lap I put my thin waterproof jacket on over the top of my Conti top and then put my orange hoodie over the top of that. I was properly bundled up! Getting cold also meant that my legs had begun to seize up a little and I cursed myself for staying so long when I walked out of the campsite with crooked legs and the realisation that I would be running very little of this lap. For the first time, the distance seemed to drag and as my walking had slowed I was moving at just 3mph now…Quick calculations, – it would take me longer than three hours to get round this final one! It didn’t matter though. I just had to keep moving forward. I knew I would finish now and that was a huge relief. By 5am it was light and I could turn my headtorch off once more. I still managed to pass several others though who must have stopped for longer than me. I was pretty sure that I had passed at least one other 70 mile runner by this point and although I wasn’t sure at the time how many others were running that distance I liked the idea of improving my placing. By mile 65 it had been a long while since I had seen another runner and I decided to post for some inspiration and encouragement on Twitter. Twitter of course, did not disappoint and I had loads of lovely messages to read through and respond to within minutes. That mile went by the quickest of them all! To save battery I disabled my internet after responding to as many messages as I could and powered on. By mile 68 though, I had been up for over 25 hours and I was incredibly emotional. I just wanted to cry. Not from pain, not because I was upset. I literally just wanted to cry. As I understand it I don’t need a reason, it’s my prerogative as a woman though, right?! I rang my Mum but could barely get any words out down the phone to her. Luckily she instantly understood and rambled on about wedding preparations down the phone, dropping in race questions every now and then as she felt I would have pulled myself together enough to be able to answer them! I scanned my race chip at mile 8 out on the course for the last time which put a smile on my face…I was really going to finish the 70 miles! Because I was so tired, I hadn’t been picking my feet up as high and a bramble caught itself around my ankle here, ripping into the flesh and letting blood pour down my leg. I literally barely felt it. I was heading to the finish! Although my left leg had stiffened up by now and running was no longer an option, my pace picked up and I was back to my 15 minute miles again. Amazing how much difference a running pal can make! A mile further on and John had walked back to find us. Queue more sobs. They both fiercely told me that they were going to jog on the 400metres or so ahead so that they could see me through the finish and that I wasn’t to cry! 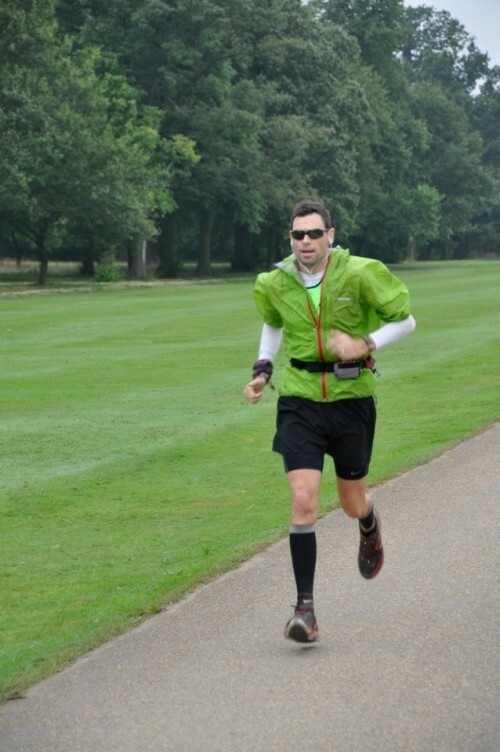 I knew that Colin would be on his last lap by now, and close to also finishing his 100 mile race. I’d kept checking over my shoulder for the past mile to try and spot him, but I could hear him behind me now. Running. Somehow my legs began running. 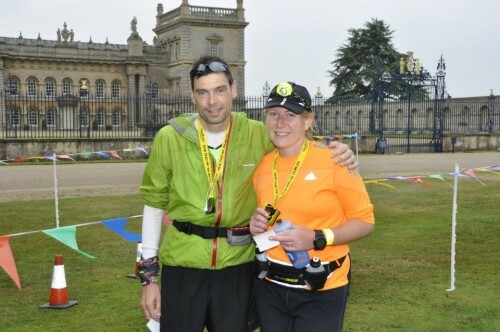 I had been so certain they had nothing left in them but they managed to have (what felt like) a sprint finish left and Colin and I came through the finish together. Me, 70 miles…Colin 100. A massive 7 hour PB for him! You can see my lip quivering in all of the pictures where I am headed to the finish. I was trying so hard to hold it all together! The second I crossed the line though to loads of cheering and hugs and having my medal placed over my neck I was a sobbing mess! I literally could not stop crying. I remember several photos being taken so I’m sure John has got many pictures with tears down my face! I’m not a cryer…I was just so very tired! We headed to the tents for a post race Guinness for Colin and sausage sandwich for me, although I felt very weak now that I knew it was all over and never finished my sandwich. Instead, dived into my tent for a quick snooze. An hour later I awoke to hear everyone outside the tent discussing if it would be possible to pick the tent up with me in it to place in the van! Glad I awoke when I did! After scrambling back out I became aware that the campsite and been cleared and walking was now not an option. I think it was John and Kev that half carried/half supported me over to the van. The top of my left calf was incredibly tight and would not straighten out at all. I’m not going to lie. Despite saying I’d only run 70 once and that I had no intentions of ever running further, I’ve already been thinking about tactics for improving my time and the possibility of a longer race…! Shhhh…don’t tell Dan! Brilliant report! Well done you!! Amazing … I DEFINITELY would have cried too!! Go go go Ultra Queen!!! p.s. 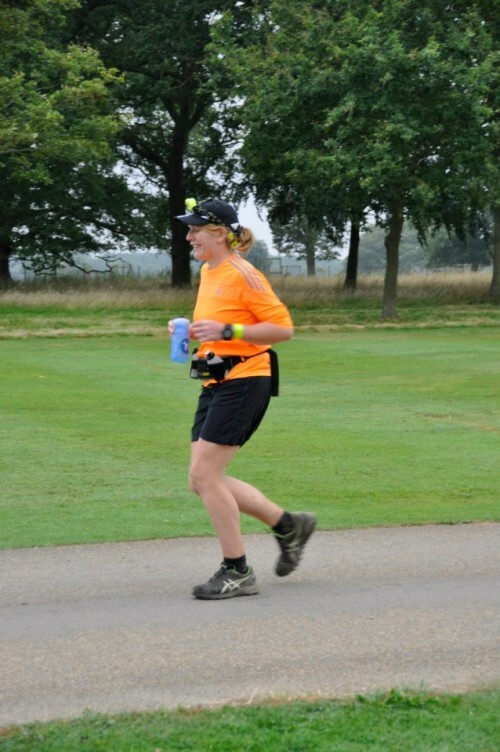 I’m considering the Thames Path 100 … fancy it? This is so epic! What an amazing achievement! I have cried quite a few times at the end of races, I definitely would have after this too! Glad it’s not just me then! I literally had no control over my tears at all! This sounds incredible. My only comparison I can make is our ultra run at our club (we call him The Machine). He did Endure (the 24 hour race) solo and managed 15 laps, so a total of 75 miles, in 24 hours. I’m pretty sure you could have beaten him! And that’s amazing – he’s built like a brick wall!! I’m really pleased all your nutritional issues were sorted and you were well fueled throughout the race as I know you mentioned concerns in previous post. Sounds like oranges are a great strategy for you! I think getting emotional is a natural reaction – it’s such an achievement and you’ve done amazingly. I love that you rang your mum towards the end. And bless her for rambling on – doing what mum’s do best hehe. Can’t wait to hear what you plan to do next, when you know anyway! And also, when you get a chance of course, how you recovered from such an epic race. All fascinating stuff to me! Huge well done once again! I do like apples (although not as much as you!) but I’m pretty sure I wouldn’t be able to stomach them on a race…I’d stick to the cake! My main form of recovery has been honeymoon obviously but I’ll get a proper post up about the more traditional recovery things I did soon! Ooh, you more than deserve that spa day – I’ll bet it was absolute bliss! I have to say that you’re a total badass for running that course in the dark. There are so many places where you could totally wipeout (and apparently a few people did – one guy almost broke his ankle!) and I’m very glad you have a better sense of equilibrium and balance than I do! The spa day was amazing! Absolutely spot on what I needed after my legs had gotten me round those 70 miles! My head torch was dying towards the end of the first lap in the dark and I was so glad it had remained bright for the section through that little wood at mile 2.5 otherwise I’m sure I would have wiped out as well. There are only whisperings of the 100 at the moment. I’m more concerned about being able to stay awake for that length of time than anything! HOLY MOLY! once again, you are a super woman…. i like your new nickname, totally deserve it!!! i cant even IMAGINE what this must have been like…. i cant even stay away that long! And rigth before your wedding?!?!?! UNHEARD OF – You are one tough cookie and amazing athlete! Haha! I’ll let you off…you got my arse in gear to get it written! In total awe! That is just insane, well done you, so much to be proud of! Thank you! I can say that I honestly do feel proud of this and couldn’t wait to tell everyone how I’d gotten on! So amazing! You should be very proud. I don’t blame you for crying, I definitely would have done. I doubt I was the only one that day with tears in their eyes at the finish! Amazing amazing amazing, well done!!!!! Wow that is amazing Mary well done! I am not surprised you felt so emotional- it is such a fantastic achievement (and being awake that long is tiring on its own, never mind running 70 miles!!!!). Hope you are feeling recovered now. Thank you! I’m finally feeling recovered now! 😛 It was the staying awake that really drained me I think and if I ever went further (looking more and more likely!) I know I’d need to do it quicker so that I didn’t fall asleep whilst still running!